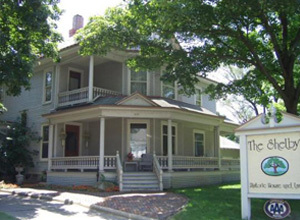 This hotel is 2 miles from downtown Springfield, Illinois and Bunn Park Golf Course. 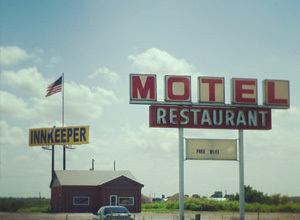 It features a small museum of Route 66 memorabilia and offers spacious rooms with free Wi-Fi. Yesterday’s Restaurant, located at the Route 66 Hotel and Conference Center, offers American cuisine in a casual atmosphere. Donnie B’s Den, bar and comedy club, is offers food and drink each evening. 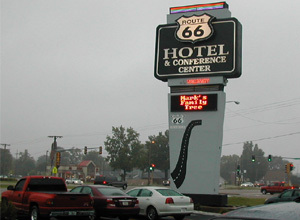 Guests of the Route 66 Hotel can enjoy free access to the seasonal outdoor pool and a full-service business center. Free parking is available on-site. A cable TV and coffee maker are standard in every room. All rooms are brightly decorated and include a seating area and a telephone with free local calls. The Abraham Lincoln Presidential Library and the Illinois State Museum are both within 3.5 miles of the hotel. Capital City Shopping Center is 2.6 miles away. This Joliet hotel is located 2 miles from Inwood Golf Club and less than one mile from Joliet Regional Airport. It features an indoor pool and rooms with free Wi-Fi. 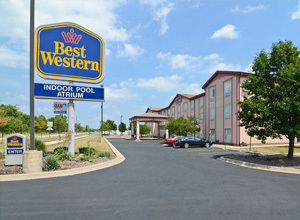 Best Western Inn and Suites Joliet offers air-conditioned rooms furnished with a microwave and refrigerator. Each room has a cable TV, coffee maker and safety deposit box. A daily continental breakfast is served in the morning at Joliet Best Western Inn. Guests can work out in the gym or relax in the hot tub. The 100% smoke-free hotel has a large solarium and free parking. Harrah’s Casino in downtown Joliet is a 13-minute drive from the Best Western. Chicagoland Speedway is 10.3 miles away. This hotel features air-conditioned rooms, a heated indoor pool and complimentary buffet breakfast. It provides dry cleaning and daily housekeeping services. Harrahs Casino is 20 minutes’ drive away. All rooms at SpringHill Suites Chicago have deluxe bedding such as a feather pillows and thick mattresses. All rooms have cable TV and a mini-fridge. Guests can enjoy a wholesome breakfast made from fresh, seasonal ingredients. The hotel also offers a read-to-go breakfast option. 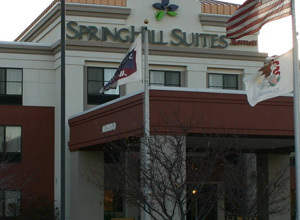 SpringHill Suites Chicago Bolingbrook is 15.5 miles from Oakbrook Mall. Seven Bridges Ice Arena is 15 minutes’ drive away. 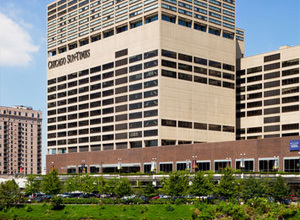 Featuring panoramic views of the river and city skyline, this hotel is centrally located just 10 minutes’ walk from the famous Magnificent Mile. Guests can relax or play in the on-site indoor swimming pool. A 32-inch flat-screen TV and free WiFi are included in every guestroom at Holiday Inn Chicago Mart Plaza River North. There are luxury bath products, premium bedding, and a complimentary newspaper as well. Italiasa Restaurant serves a fusion of Italian and Asian cuisine for dinner. Cityscape Bar, with sunset city views, offers clever appetizers, craft beer, organic wine, and specialty cocktails. The fitness centre features aerobic and cardiovascular machines at the Mart Plaza Holiday Inn. The on-site business centre offers full service printing and faxing. Navy Pier is 2 miles away. Scenic Millennium Park and the Theater District can be reached in 5 minutes’ drive. Located 7 miles from Oakbrook Shopping Center, this Glen Ellyn motel offers free Wi-Fi throughout the property. Each guest room is equipped with cable TV. A microwave and refrigerator are included in every room at Budgetel Inn. A work desk is also provided in the air-conditioned rooms. 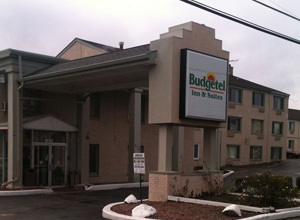 24-hour reception services are available at Glen Ellyn Budgetel Inn. Guests can take advantage of free on-site parking or purchase a drink and snacks at the provided vending machines. The College of DuPage is 3 miles away from this hotel. The scenic Morton Arboretum can be reached in 12 minutes’ drive. Located 5 minutes’ drive from water activities at Lake Shelbyville, this Illinois motel features free Wi-Fi access. Boat parking with electrical charge sites is available on site. A flat-screen cable TV is provided in every air-conditioned room at The Shelby Inn. For convenience, rooms include a coffee machine. Featuring a bath or shower, private bathrooms also come with free toiletries. Guests can relax on the outdoor terrace at Inn Shelby. Free parking is offered at the Shelby Inn. Deer Trail Golf Course is 9 minutes’ drive away. Mattoon, Illinois is 43 km away. Located off Interstate 55, this Hamel, Illinois motel features an on-site restaurant and lake views. Each guest room is equipped with free Wi-Fi. A 32-inch flat-screen cable TV with HBO is included in every room at Innkeeper Motel Hamel. For added convenience, a microwave, fridge, and coffeemaker are also provided. The Other Place on the Hill Restaurant is located on site and specializes in pizza and pasta. 24-hour reception services are offered at this motel, along with access to fish at the lake. BBQ facilities are available outside for dining al fresco. The Children’s Museum of Edwardsville is 8 miles away. Southern Illinois University is 12 miles away.